One of the most often served vegetable dishes in Florence. 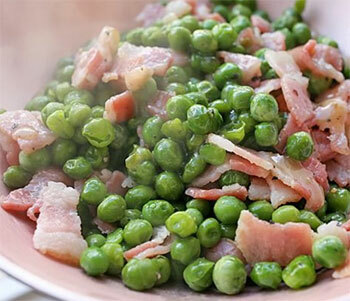 The springtime fresh pea season is short in Tuscany, but since this is such a favourite, we've gone global, using the best frozen peas we can find. Whirl up any leftovers with a touch of broth, milk or water for a wonderfully sweet pea soup. In a 2-quart saucepan, gently cook olive oil, garlic and ham or bacon for 2-3 minutes, being careful not to brown the garlic. Add the frozen peas, water, salt and pepper and cook covered for approximately 15 minutes. Adjust salt and pepper, stir in parsley and serve. See the beautiful picture that Joanna took of her Piselli alla Fiorentina! Visit her blog for more great photos! The recipes for such yummy photos, unfortunately, are not in English!